BOSTON -- Less than a minute after stepping back onto the floor for the first time since tearing the ACL in his right knee in Game 6 of the NBA Finals, Kendrick Perkins took an inside feed from Ray Allen, burrowed into two defenders in the lane, and completed an and-1 layup that nearly blew the roof off the TD Garden. As Perkins emphatically stomped around the perimeter, congratulating every other member of a reunited starting five, Allen took a minute to savor what was happening as Perkins' return brought the Boston Celtics one monster step closer to being whole again since letting a world title slip away last season. "We have kind of been, I don't know what words to use, but less than ourselves over the three or four months that we haven't been together -- just waiting," Allen said of a Perkins-less start to the 2010-11 season. "We have had great success with the guys that we've been using, but we haven't had the lineup that has been consistent over the past 3 1/2 years, where we have won some big games, including a championship." And in the Celtics' minds, it should have been two championships. But when Perkins' knee gave out while battling Andrew Bynum for a first-quarter rebound during Game 6, so too did Boston's ability to close out the series. The Lakers won the final two games, dominating a thin and depleted frontcourt, leaving the Celtics wondering what could have been if not for Perkins' ill-timed injury. Even with an Eastern Conference-best 34-10 record after Tuesday's 112-95 triumph over the Cleveland Cavaliers, the Celtics have been decimated by injuries this season, most notably up front with 38-year-old Shaquille O'Neal and 32-year-old Jermaine O'Neal (who, at times, has the knees of a 38-year-old; or maybe a 58-year-old). The O'Neals alone have missed 37 combined games this season. That's part of the reason Perkins lobbied so hard to return Tuesday night, 10 days in advance of the Feb. 4 date he had originally targeted earlier this month. When the team's medical staff offered a joint thumbs up on Monday, Rivers didn't think twice about injecting Perkins back into the lineup. Shaquille O'Neal hopes to be back during an upcoming four-game road trip (hint: Sunday vs. the Lakers); Jermaine O'Neal is in the middle of a four-week rehab stint that Celtics president of basketball operations Danny Ainge is adamant will allow him to be a contributor for the stretch run; and Delonte West is entering the final stages of his rehab from a broken right wrist. Perkins' return was the biggest domino to fall. The others will tumble in time. And so, too, the Celtics hope, will the competition. "We always talked about [the potential] once we got [healthy], especially all the way back," Perkins said. "We'll be pretty much unstoppable, especially in our frontcourt. We can throw Shaq, Kevin [Garnett], [Glen "Big] Baby" [Davis], [rookie and current spot starter] Semih [Erden] at anybody. ... We've got all the weapons." Those weapons in tow, the Celtics return to the scene of the crime Sunday when they visit the Lakers for the first time this season at the Staples Center. Perkins suggested a late January visit won't mean nearly as much as a mid-June stopover. "I really don't care, unless it's the Finals," Perkins said. "Regular season doesn't matter. It won't mean too much. I try to forget about [getting injured there]." For all their success this season, the Celtics have struggled against lesser opponents, often playing down to their level and lacking proper energy. It's what plagued them in a loss Saturday to the Washington Wizards in which they squandered a 16-point, first-quarter lead. Against a Cleveland squad that carried in a 17-game losing streak, the Celtics had no such issue. Before the game, Rivers gave a little speech welcoming back Perkins. You would have thought Boston was getting ready for a playoff game the way the room responded with an outburst of cheers and celebration. "They were excited," admitted Rivers. "You could see it." Because the Celtics can now see it. That puzzle is finally starting to come together. And while getting back to the Finals is no easy task, in that moment following Perkins' first bucket of the 2010-11 season, the entire starting five felt that familiar chemistry again. After more than six months, the Celtics are finally whole again. ESPN Boston's Chris Forsberg is a regular contributor to the Daily Dime. LOS ANGELES -- We get so caught up in the most obvious attribute Andrew Bynum -- his height -- that we forget his youth can be just as valuable. When he starts ahead of Lamar Odom, the 23-year-old Bynum singlehandedly drops the average age of the starting lineup from 32 to 30.4. More than the numeric benefit that makes the Lakers seem less geezer-ish, there's still that desire to make a full-fledged contribution after he limped his way through the past two postseasons. And on nights such as Tuesday, when the Lakers dominated the Jazz 120-91 he showed just how essential he is to Lakers' chances of winning their third consecutive championship. Bynum was the biggest difference maker Tuesday. He had a plus-minus of plus-27 in his first 16 minutes. He played only 27 minutes the whole night and scored 19 points, right in the thick of four Laker double-digit scorers, and he posted game-highs with 11 rebounds and three blocked shots. "Pretty good example," Phil Jackson said of Bynum's role on the team. "A lot of interior shots that Utah gets, he disrupted or changed the shots and made them miss and helped us out a lot inside, and obviously had a lot of opportunities himself." Lately I've been keeping my own stat: SOBOA, or Shots Over Bynum's Outstretched Arms, to get a sense of how opponents fare when Bynum contests their shots. Tuesday night the SOBOA percentage when Bynum played in the first three quarters was .273 (3 for 11), showing just how difficult Bynum can make things when he's challenging shots. Bynum said he's focused on making a difference on defense. "That's the biggest thing," he said. "We have a lot of scorers on this team. You get a play run for you, you better be successful with it. Defensively I can be active and challenge a lot of shots, change a lot of shots." He can also change the perception -- voiced most notably by Jerry West -- that the Lakers are an old, worn-down team. The only thing old about the Lakers on Tuesday night was the same old results against the Jazz in Staples Center, as in their 17th consecutive homecourt victory over Utah. • Read the rest from Adande at TrueHoop, ESPN.com's NBA blog. Zach Harper, TrueHoop Network bloggers and fans gave their in-game opinions throughout Tuesday's slate of NBA games in Daily Dime Live. We've had the LeBron Lottery. The Blake Griffin Lottery. The John Wall Lottery. This year, it's anybody's game. Usually by January, a consensus front-runner for the top pick has emerged. When it hasn't been a lone player like LeBron, Griffin or Wall, it's been a debate between two elite players, such as Greg Oden and Kevin Durant or Derrick Rose and Michael Beasley. But not only is there no consensus No. 1 at this point for the 2011 NBA draft, most NBA general managers are struggling to come up with anyone who even deserves to be drafted first overall. "When you think of the No. 1 pick, you think of a franchise player who can almost single-handedly begin to turn around the fortunes of your franchise," one lottery-bound GM told ESPN.com. "You expect them to be an All-Star, maybe even a superstar down the road. That's why the draft is so important. This year, I'm struggling to tell you who that guy is going to be." Mavs' backup backcourt: Jason Terry and J.J. Barea combined for 53 points on 59 percent shooting to help erase a 15-point second-quarter deficit and lift Dallas to a 112-105 win over the Clippers. Historically bad Cavaliers: The confident-looking Cavs that opened the LeBron-less era by knocking off the reigning East champs were nowhere to be found in Boston. With Kendrick Perkins in tow, the Celtics pummeled the Cavs 112-95, marking the first time in franchise history Cleveland has lost 28 times in a span of 29 games. "It felt good. The first quarter I got a little tired. After that I got my second wind and I was all right. It felt good to be on the floor." -- Celtics center Kendrick Perkins, on his first game back in six months after offseason surgery. DALLAS -- Los Angeles Clippers rookie sensation Blake Griffin says he's not worried about the bruised left elbow he suffered in Tuesday night's road loss to the Dallas Mavericks. "It's not too bad," Griffin said at his locker after the Clippers' 112-105 defeat, wearing an ice pack on his left elbow. With the Clippers down four after blowing an early 15-point lead, Griffin landed hard in the paint on his elbow with 42.5 seconds to go in the third quarter after a foul by Dallas' Brendan Haywood as Griffin rose to the bucket. Haywood was assessed a flagrant foul-penalty 1. After being fitted with a sleeve over the elbow on the Clippers' bench, Griffin played a labored 4:09 in the fourth quarter, managing just one point before exiting with 4:31 to play and with Dallas' lead up to 105-89. John Wall had a double-double (10 points, 13 assists) for the ninth time in 15 games. ... 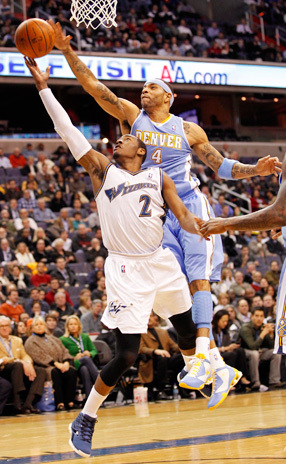 But the Wizards also lost for the ninth time in 15 games, falling 120-109 to Kenyon Martin's Nuggets. • Tyson Chandler converted all five of his field-goal attempts and all 11 of his free throws in the Mavericks' win against the Clippers. Only two other NBA players in the last 50 years were 5-for-5 or better from the field and 10-for-10 or better from the foul line in a regular-season game: Kelly Tripucka (8-for-8 and 11-for-11) for Utah in 1987 and Buck Williams (5-for-5 and 14-for-14) for Portland in 1991. Additionally, Larry McNeill did that for the Kansas City-Omaha Kings in a playoff game in 1975. • Paul Pierce scored a game-high 24 points, all of them in the first half, in the Celtics' 112-95 victory over the Cavaliers. Two other NBA players over the last five regular seasons scored 24 or more points in the first half of a game and then failed to score after intermission and each did so for the Knicks: Jamal Crawford in April 2008 (25 points at Indiana) and Nate Robinson in November 2008 (24 points vs. Charlotte). • Kwame Brown scored 13 points and pulled down 18 rebounds in Charlotte's win at Sacramento. It's the second time this season -- each within the last 10 days -- that Brown reached the teens in both points and rebounds in the same game. He had only one 13/13 (points/rebounds) game over the previous four seasons combined.